Another month, another of eats so extensive that the roundup needs to be split up into 2 posts... but I'm certainly not complaining! I'm slightly concerned that my blog is simply food roundups, though I'm interested in writing about more alternative foods and forms of healing- something that really inspires me to put myself out there on social media, and to write more, is that it made me mad that I wasn't aware that all these alternative, and EFFECTIVE forms of healing weren't embraced by the mainstream and by doctors (and I sure as hell wasn't about to listen to a bunch of hippies, because what do they know, anyway??) So besides food, I'm really interested in writing about that a bit more. But if there's anything else you want to read about, please let me know! I will still always write about my food finds- it's just a part of who I am, I guess- but I'm also interested in learning about what you're interested in. So, without further adieu, here are my FEBRUARY EATS (Part I). If I'm on a date where someone starts taking photos of the food... you can bet that I'm going to start taking photos, too! Usually I don't want to be rude, but hey, I'll join in if someone does it first. 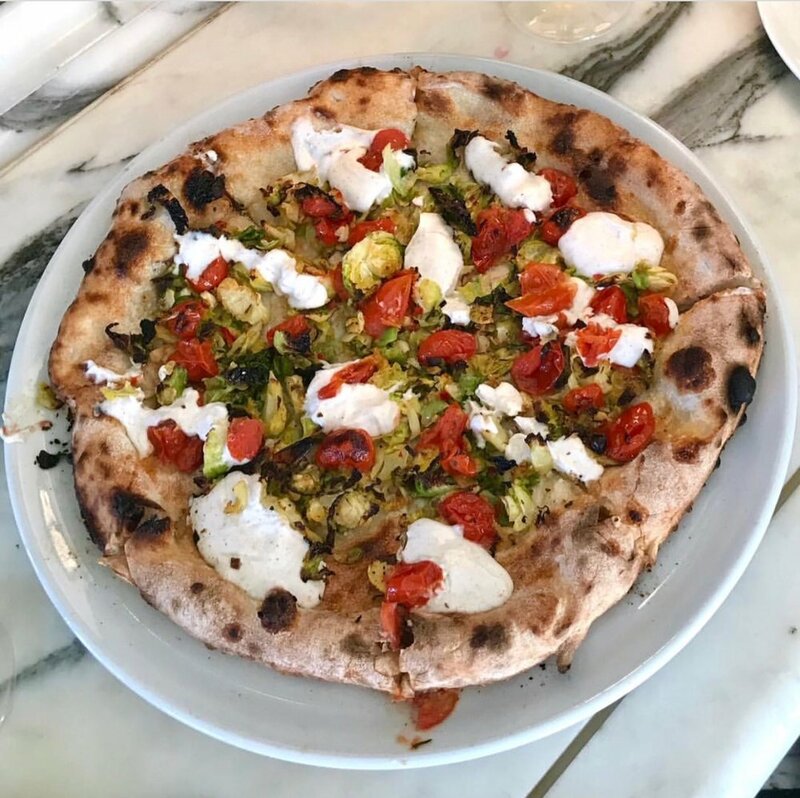 This pizza at Cecconi's has to be one of my favorite pizzas in LA- I loved the cheese, tomatos, and brussels sprouts combo! I knew Cecconi's was a fancy hotspot in LA, but I didn't know that it would be a place that would have vegan options marked on the menu. And it has to be one of the best, prettiest date spots. Who wouldn't want to meet for pizzas and mimosas? That is one surefire way to win someone over... (Note: I'm finding that the online menus are not matching up with the restaurant menu). Let's just say Beelman's has been... an experience!! Nothing bad about Beelman's- the first time I went, they were about to have a private party, so my friend and I didn't get to eat there :(. The second time I went to Beelman's was really my mistake. I was trying to go to Smorgasburg, which has tons of vegan options on a Sunday- BUT I got there way late and all the vegan options had run out :(. I was STARVING, and it was Superbowl Sunday... though I'm NOT a fan of crowds, Beelman's Bar was the closest thing to me, so I braved the huge crowds at the bar, and brought a book like the antisocial hungry girl that I was, and made the best of it. I will have to come back during something more normal! The banh mi hot dog was really good, really just a vegan hotdog with banh mi stuff, who wouldn't like that? Beelman's has a lot of really innovative options, and I'm excited to come back and try more! Yvonne's Vegan Kitchen products have a special place in my heart... all her products are gluten-free, and she is truly the ONLY ONE that has mastered the gluten-free space (in my opinion)!!! You don't have to be vegan or gluten-free to be obsessed with her cakes or products- so GO FIND HER PRODUCTS NOW, they are in 40 locations in California!!! I highly recommend her cheese :) However, if you have a special occasion, like a birthday party or a wedding, she is also an incredible cake master flex! We were so lucky to have this cake for Mrs. Vegan's (Kristin's) birthday when she was back in town from St. Louis, and it was so great seeing the whole vegan crew. 4) How's this for a festive party idea?! For Mrs. Vegan's bday party, we were all given a fresh coconut upon arrival. Who doesn't love a fresh coconut?! With this view, it felt a bit like checking in to a tropical hotel. Another great idea she had was having the party Thai potluck style, so everyone brought their favorite Thai dishes. Great to make things easy on the host, plus Thai food is delish, right? I think it might be my favorite cuisine. I brought a Papaya Salad from The Vegan Joint restaurant near me. This cute coffee shop in Santa Monica was perfectly instagrammable! So many cute pink accents, open air, very trendy space! But- it was almost funny how loud it was! It had one or two walls completely open, and fire trucks kept driving by loudly! I don't know if there's a fire station next door, or if this was just a bad day, but... maybe come here with someone who takes good photos, who you don't want to talk to that much? Haha. Hope you enjoyed Part I of my February Food Roundup. Please let me know your favorite finds so I can check them out!